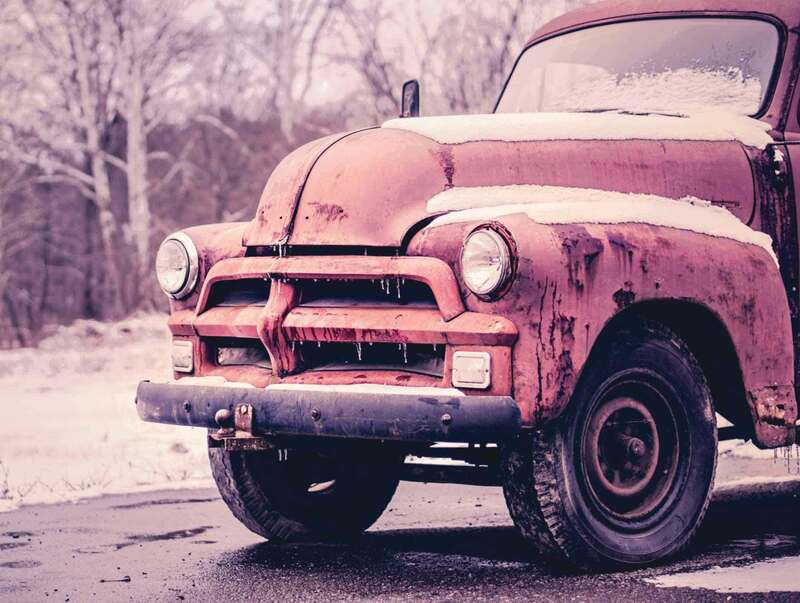 This 1954 Chevy Truck has seen better days, it has a missing hood ornament, a trailer hitch mounted to the front bumper, no hubcaps, lots of rust and an Instagram filter applied to it for good measure. The Chevy is lightly covered in snow and sits on the side of the road (or driveway) next to a deciduous forest. The windsheild is curved and the hood has a bullnose design, the joints don’t seem to line up properly when closed. The chassis of the truck sits high off the ground, about the only visible hardware below the bumper is the axel. USE THE WEBSITE LINK LOCATED ABOVE TO DOWNLOAD THIS HIGH RESOLUTION PHOTO FROM THE AUTHOR'S WEBSITE. Alternatively, you may click on the preview above to view the fullsize version — then drag the fullsize to your desktop and open it in Photoshop (in some cases the previews on this site are smaller than the original source).